NUFC star ‘attracting interest’ from Arsenal & Spurs – but won’t play again this month – NUFC blog – Newcastle United blog – NUFC Fixtures, News and Forum. According to the Mirror, both Arsenal and Spurs are now tracking Fabian Schar after his impressive displays at St James’ Park – however he will now miss our next two games after picking up his 10th booking on Saturday. It’s little surprise to hear that he’s caught the eye of a few top six sides, with ball playing defenders being all the rage these days – not forgetting he’s been a big part of the 6th best defence in the division this season. ‘Fabian Schar has put himself back on the radars of Arsenal and Tottenham . ‘Defender Schar, 27, has played a key role in Newcastle ’s recent upturn, catching the eye of the north London duo. ‘The Swiss stopper has made 21 appearances, and scored three goals, for Rafa Benitez’s side since his bargain £3million move from Deportivo last summer. He’ll be missed in our next two games – with him now set to miss our trip to Bournemouth and Arsenal – however we do have several capable centre-backs able to take his place, with Fernandez, Dummett and Clark all capable of coming into our three-man defence. The yellow card itself was incredibly petty, seeing him throw the ball away in frustration in the second half of Saturday’s game, but we should be in safe hands if someone like Fernandez comes in. After all, the Argentine was one of our top performers over the start of the season and must feel incredibly hard done by to have missed out on Rafa’s match day squads lately. That said, it wouldn’t surprise me if we reverted to a back four, played Lejeune and Lascelles (provided the latter’s knee is ok) and put Dummett back in at left-back. 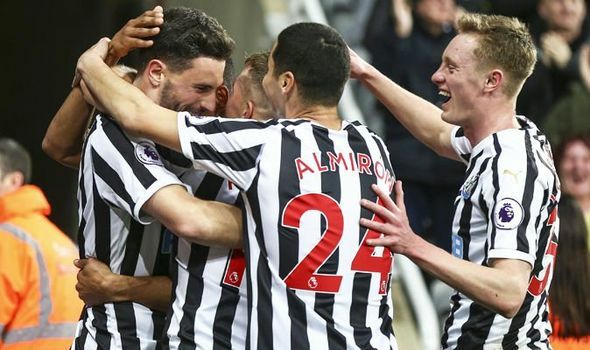 Perez reveals what several NUFC players said during Everton celebrations – I love this.. I love Benitez to bits, but he’s doing one thing that will absolutely infuriate Mike Ashley.. Here we go again! Every time we have a good run and a player has a good spell, the big boys come calling. I hope that Ashley can see sense and keep Rafa and trust him to build a team that both the club and the fans can be proud of for seasons to come. It is now time for all involved to be truly as our name suggests NEWCASTLE UNITED!